This page is intended for Early Childhood Educators to use as a resource to find all of NETA's curriculum. This Month - At Your Site! Corn is a vegetable and a grain. It is a vegetable when the kernels are soft. It is a grain when the kernels become hard after harvest. We eat corn on the cob, tortillas, popcorn, corn flakes, and corn chips. 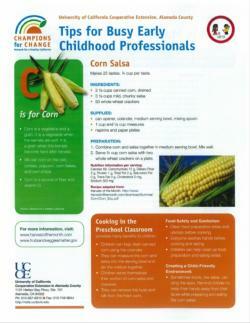 Corn is a source of fiber and vitamin C.
What did the children think of the Corn Salsa recipe? The children did not like it. I did not make the recipe.